Practical considerations and decorative choices are both equally important. How To Cover Floors? Make sure that flooring options are not an afterthought once you have completed all the other decoration in a room. Such a large surface area contributes significantly to the total decorative look, and it deserves careful thought at the same time as you choose other decorative materials. Much of the equipment needed for flooring is already a part of most household tool kits. Renting specialized tools: Rent specialized equipment if you need it. It is usually expensive, and you are unlikely to use it enough to justify buying it. Checking rented equipment: Make sure that equipment is working and has all necessary operating instructions and safety recommendations. Planning tool use: Plan “Cover Floors” work so that you rent equipment only when you need it. Do not rent an item on day one if you will not require it until day three. Decorative features are highly influential when it comes to choosing flooring, but practicality also must be considered, as does the ease with which a floor can be laid. Take your time when weighing options before making choices. Wooden flooring: These range from basic planking to veneers. Block floors are another option. Carpets: These include good-quality burlap-backed as well as less expensive foam-backed varieties. Naturally occurring fibers such as sea-grass and jute also fall into this category. Utility flooring: Sheet flooring, such as vinyl and linoleum, is hard-wearing and washable. Carpet and vinyl tiles are more decorative yet still practical. All purely decorative considerations aside, the economics of buying and laying flooring deserve serious consideration. A major factor is how long you expect a floor to last. Flooring is not permanent, but neither is it easily removed, and it represents a significant financial investment. Considering your stay: Many floor coverings are difficult to remove once laid so will need to be left behind when you move. Bear this in mind when deciding how much to spend on flooring. Including the preparation: Consider the preparation that might be required prior to laying a floor. It may prove costly to lay flooring if the sub-floor requires a great deal of work. Old floorboards, for example, would need a lot of preparation to make them ready for laying ceramic tiles. Planning an entire room: Remember to include flooring when color-scheming and styling a room. Obtain floor swatches as well as paint and paper samples. Budgeting will be far easier if you consider flooring when you plan the rest of your decorating. Determining period: When choosing flooring, consider its pattern and style in terms of the historical period of your house, if appropriate, as well as the decoration in other rooms. Being accurate may require some research. Working out floor surface area is relatively simple: just multiply together the relevant dimensions. Bear in mind a few other considerations, depending on the flooring. 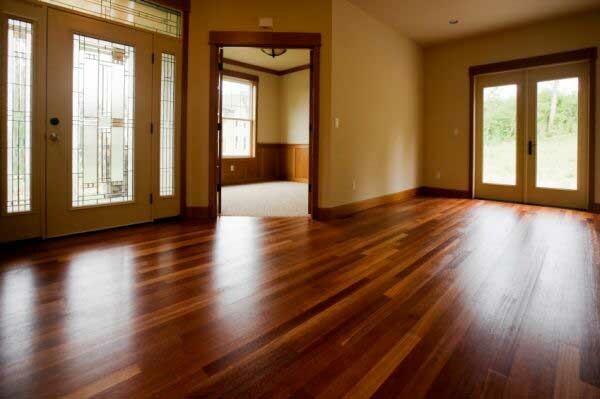 Wooden floors: Allow ten percent extra for wastage arising from cutting. Carpets: These are sold in rolls. Work out the direction in which it will he unrolled to minimize wastage. Tiles: Allow extra tiles for any cutting that will be required at joins and edges. The suitability of a flooring for a particular preference. Any floor covering is clearly better room is determined by the function of that suited to some areas than others, depending room, how much flooring is required, and your comfort on it, appearance, and durability. When choosing flooring for a particular room in a home, it is essential to bear in mind how much the area will be used and whether, for example, people using the room will be wearing outdoor shoes or going barefoot. There are many options to choose from for each room in the home. Children: Luxury carpeting can easily be spoiled by the activities of children. Consider laying inexpensive carpet or other types of flooring while children are young. Pets: Hard flooring may be advisable in rooms to which animals have access. Young cats and dogs can spoil carpet and natural-fiber flooring. Establishing fiber content: Make sure that no one is allergic to the constituent materials of a floor covering. You cannot afford to discover this after you have laid it. Going for quality: Choose as good a quality of flooring as you can afford. The better the quality, the longer the flooring will last without looking worn. Protecting corridors: The flooring in areas leading into adjoining rooms usually wears most quickly. Lay durable flooring, or protect these areas by also laying rugs or carpets. Adjusting to lifestyle in busy households: Choose a patterned or flecked carpet to disguise wear. Stains and dirt will also be camouflaged. Tip: We have much more… For more information on the home decoration, flooring, and “How To Cover Floors” subjects, click on the “tags” below. Do It Yourself Like a Designer How to Filet Crochet? How to Create Paint Effects on Walls Interiors? How To Lay Wooden Floor? How Can I Tile The Walls? How Can I Make Menu Cards At Home? How Can I Wallpaper By My Self? How to Lay a Tile Floor?